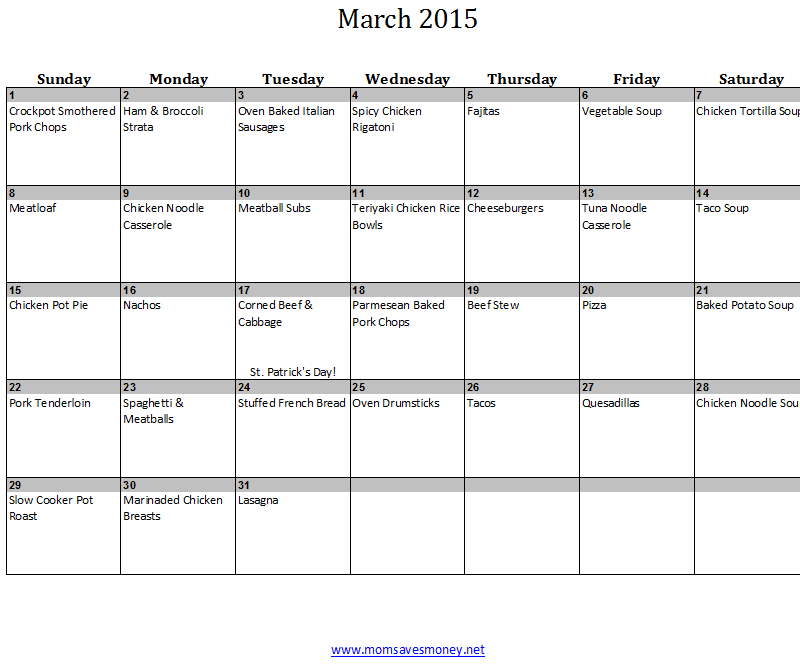 March Monthly Meal Plan with Calendar & Recipes! March is sneaking up on me! How is this Sunday already the first of March? WOW! However it happened, now is the time to start thinking about what to eat in March. Maybe this monthly menu plan will inspire you – if nothing else, it’ll give you a good place to start! I tried to have a variety of meals each week – some beef, some chicken, some pasta, some soups. In particular, this month I planned soup meals for Souper Saturdays. And comfort food for Sundays. And foods that can easily have meat removed if you’re celebrating Lent. That way you won’t get too bored. But there are also plenty of ways to save time when using this menu plan. Examples: When prepping chicken at the beginning of the month, make enough for the other recipes and freeze it for future use. When making ground beef, brown 2-3 times the normal amount and freeze that. It makes it super quick to pull meals together! I’m definitely going to try the Parmesan Baked Pork Chops this month! I love super simple recipes!